Hey everyone! I don't know about ya'll, but I've been a "ball of energy" today, and that doesn't happen very often. I was so excited to have finished my Christmas decorating yesterday, that today I hit the ground running to get everything cleaned up. The entire house has been vacuumed, dusted, mopped and scrubbed from bathroom to bathroom.....ahhhhh! Sooooo.....what to do now? Well, I thought I'd share the trials and tribulations of decorating our main Christmas tree. I do this in the hopes that it may help someone else who finds themselves in a similar situation. So, here we go. Hey everyone! I hope ya'll had a wonderful Thanksgiving weekend and have most of those "leftovers" taken care of by now! I FINALLY finished my Christmas decorating. I've been working on it for over a week, but didn't really feel the "push" to wrap it up until the last couple of days. Frankly, I was just tired of the mess -- glitter and faux snow everywhere, piles of ribbon, boxes and boxes of ornaments -- whew, my guest room was a disaster. My craft room is still suffering the aftershocks of all that was going on and the floors all need vacuuming, but that's a job for tomorrow. Tonight I want to start sharing. I promise not to do "photo over-load," but will share smaller bits at a time. This cookbook is all about cooking with high quality ingredients and simple preparations, cooking seasonally, and avoiding the crutches of sugar, salt and fat. It is not a "health" cookbook, but rather a "good food" book filled with great-tasting recipes that just happen to be good for you! It has been on Amazon's Best Seller List as well as The New York Times Best Seller List. It is already into its second printing. This handsome young man is our son. He is the one behind all the recipes. 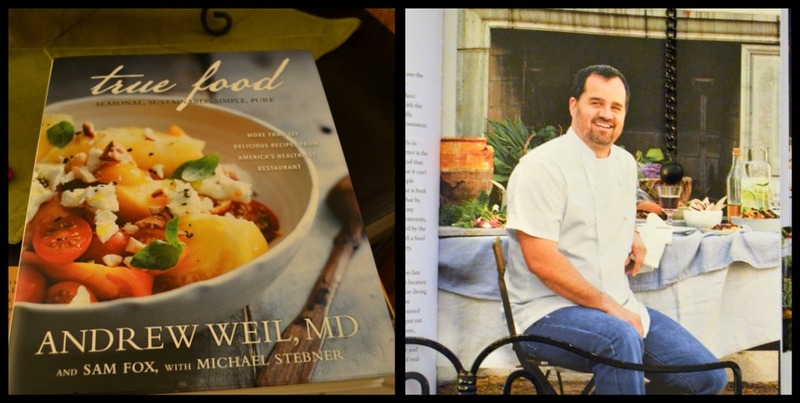 He spent over a year in the "test kitchen," creating, tweaking and taste-testing every recipe for this cookbook. I HAVE ONE OF THESE BEAUTIFUL COOKBOOKS FOR ONE OF YOU! for one chance to win. Simple, right? A winner will be chosen at random and announced on December 1st! I truly hope you will participate in this give-away and "Good Luck to One & All!" Hey everyone! Happy Black Friday -- at least I hope it's happy for all the retailers! I hope everyone had a wonderful Thanksgiving with family and friends. Our son and sweet DIL hosted our family feast this year, and it was fantastic! The Man and I contributed the turkey this year, which our son picked up on Tuesday. We ordered a 20lb. "Free Range" bird from Sprouts Farmers' Market. Ours didn't look like this. Our turkey got cooked in the wood-fired pizza oven. The bird getting his temp taken! Michael removes all the dark meat from the turkey prior to cooking. He perfected this technique several years ago in one of the restaurants -- he forms the dark meat into a roll and wraps it tightly in foil (also wraps the legs in foil) and starts cooking all of that first, because it takes longer to cook the dark meat than the breast. This way, the breast meat doesn't get all dried out. Okay, no one said it was pretty! But it certainly was delicious! After 40+ years of always cooking Thanksgiving dinners, I have officially handed over the reins to Michael and Ally. It's their favorite meal to cook, so they have asked to do the honors. It was a bit strange not having those wonderful smells in my house, but I got over it! Ally's table was lovely, but I almost forgot to take a picture. Her table runner was a painter's drop cloth folded and then layered with the lovely glass hurricanes and candles, some branches & leaves, and various, pumpkins and squash. We had these 4 charmers to keep us entertained. Our oldest, Riley and Taylor, and our youngest, Flynn and Avery. Our other two grands, Parker and Phoebe, were with their mother for Thanksgiving. It isn't easy, but we have to share. for stopping by. Tomorrow I will be making a little announcement, so stay tuned. It's going to be a good one!!! 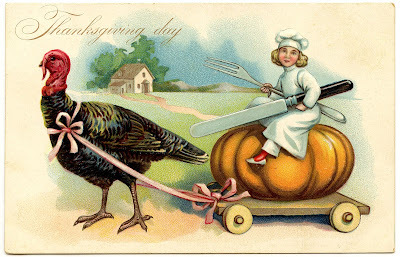 I truly hope that whatever you might be doing, whoever you may be with, or wherever you may be going on this wonderful Thanksgiving Day, that it is a day filled with gratitude and love for all of the people who make your world the place you want it to be. people each and every day. do feel very blessed to have ya'll in my life. I hope everyone has a simply marvelous day! And So It Begins -- Ho! Ho! Ho! Hey everyone! I hope everyone has had a wonderful weekend. I've been working almost non-stop on my Christmas decorating and find I am still not finished -- oh my! I'm getting close, however, and would like to share part of my kitchen today. First up is my kitchen tree! I had a kitchen tree last year, but this one is much more whimsical. My kitchen theme for Christmas is "snowmen," but this tree just has lots of fun kid-related & inexpensive items. Hey everyone! Just popped in to let you know about an upcoming party, hosted by Dawn at Creative Cain Cabin. Dawn has become one of my special "Bloggy Friends," and is such a sweetheart. I don't know if this is her first "Linky Party," but it's the first one I've known about. I know it's going to be so much fun, so read all about it below. I hope to see you there! The "Cabin" is hosting a Christmas Decorating Party on a Budget. 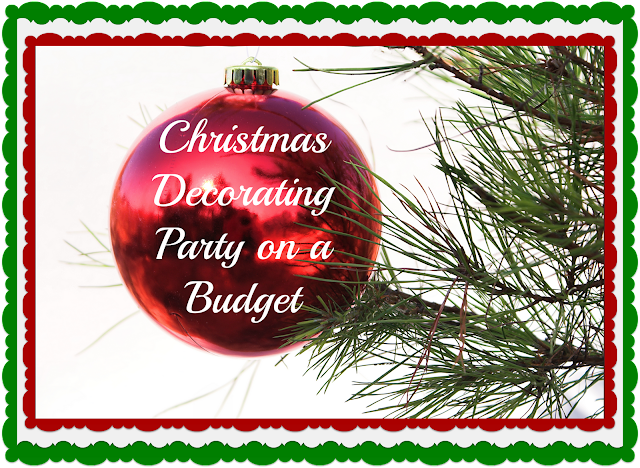 It will be a Linky Party, to show off how you are decorating for Christmas on a budget. This is a great way to get new ideas, and meet new friends. upcycling things, or just getting creative without breaking the bank. I will feature the top three the following week. And just what's been going on here at An Oasis in the Desert you might ask? I've been busy, busy getting my home all decked out for Christmas. I got an earlier start this year, because I'm not hosting Thanksgiving here this time. My house has been and still is a disaster......oh my! I always think I can whip it all out and get it all up much faster than I actually do. Reality check -- I'm getting older, move slower, & scurrying up and down the ladder -- well, there is no "scurrying" going on! I'm having a great time, though, and hope to have some things to share soon. And just because I adore all of you and know what a curious bunch you are, I'm sharing just a couple of "sneaky peeks" to build the excitement -- as if! Anyway, come back soon & see what I've been up to! The "Man Cave" --Ta Da Ta Da! Hey everyone! I hope you are off to a great week. I'm busy working on my Christmas decorating but nothing to reveal yet. So today I want to share The Man Cave with you. It was a work-in-progress project for awhile, but finally got finished late summer. Fair warning, picture overload -- as usual! Plain white (well, dirty white) walls -- YUK! The carpeting isn't dirty (the lighting is bad) & was in very good condition, but The Man just didn't want it, knowing that he would be walking in and out of his shop which is right next door. Making the Switch -- Fall to Christmas! Hey everyone! Hope you've been enjoying a wonderful weekend just as we have been doing. Our Arizona desert temps have dropped considerably which definitely adds a "spring" to my step. I was finally able to unearth some long-sleeve tops from the deep recesses of my closet -- YAY! Hey, everyone! It's not very often that you get a post from me that's not heavily laden with photos, but this will be one for the record books! I just wanted to express my gratitude to a couple of lovely party hosts who have featured two of my posts. Last week, Jody and Stan at Rooted in Thyme for Simple and Sweet Fridays, featured my A Little Fall Re-Cap Tour. It was my first time, ever, to be featured, and I was beyond thrilled. Then, today I was visiting one of my favorite bloggers, Brenda at Cozy Little House for Tweak It Tuesday, and discovered that she had featured my And You Thought I Was Finished -- Ha! Ha! post! Wow, I am so flattered by both of these features. I do not blog for monetary purposes, but I think that's a wonderful thing for those who choose to do that. I blog for the sole purpose of having fun and sharing my various passions. I really never expected to have any Followers (heck, I really didn't understand that whole "follower-thing") when I started this little blog two years ago. I couldn't imagine that anyone would find interest in much of anything I had to say; but it was a low time in my life, so it was kind of like "therapy" for me. Now it has turned into a "passion" for all the wonderful friendships that I've made and the strong bonds that feed my soul. So, yes, I am so grateful to Jody and Stan, and to Brenda for this special recognition; but I am also very, very grateful to those of you who follow and make such lovely, sweet comments on my little blog. Thank you, sweet friends. I am humbled. Hey everyone! Happy Monday to all of you. I know some of you are now putting away the Fall and Halloween decor and either getting your Thanksgiving projects going or even starting to do your Christmas decorating. Our son and DIL are hosting Thanksgiving this year, so I will be starting my Christmas "craziness" earlier than normal, but just not quite yet. I'm going to continue to enjoy the colors of Fall for a bit longer. In the meantime, I have a couple of DIY projects to share with you. Today is our laundry room. Hey, everyone! Happy November 1, 2012! Has this year flown by, or what? Anyway, hope ya'll had a wonderful and fun-filled Halloween. We really enjoyed being in a neighborhood full of Trick-O-Treaters for the second year in a row. We didn't try to keep count, but we went through two Costco bags of mixed candies each with about 150 pcs. Of course, everyone got two things, and the last few got more than that so we wouldn't have any leftovers. I'm thinking we had about 125 or so. I know some folks don't like giving treats to older children, but we don't mind. We even had a few adults and that was okay, too. Halloween and Trick-O-Treating is all about having fun! Most of the folks in our neighborhood just set up shop out in their driveways, rather than running to the door a gazillion times during the evening. That's exactly what we did, and I thought I'd share some pics of the decor and a little crafty project I did. I actually have a number of different things going on in my craft-sewing room, but we shall concentrate on this super-easy one for Halloween. Do you know what those 5 glass things are?